Amy DiSarno, with her cart at Larkinville, says gelato is less fattening than ice cream because milk is used instead of cream. If you’re going to make gelato for a living, you’d better be willing to experiment. 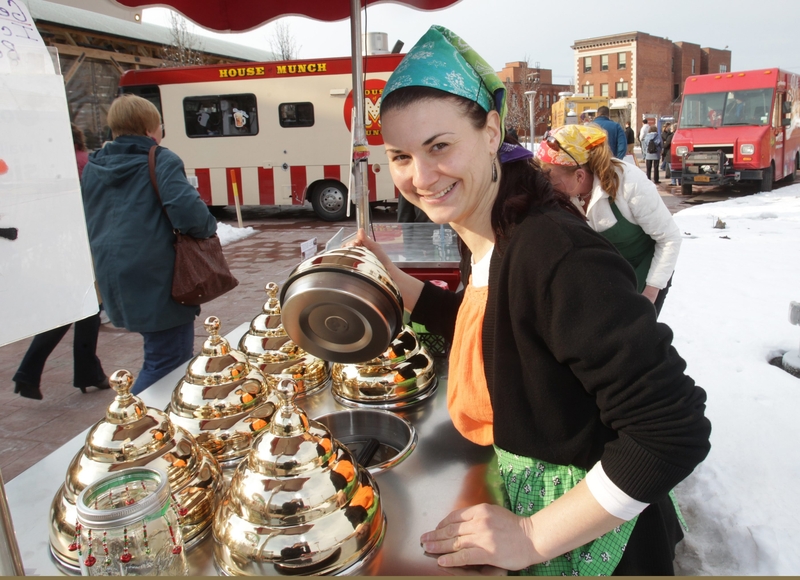 Enter Amy DiSarno, 31, of the Elmwood Village, who started hawking the chilly treat last summer out of her Gelato Gypsy mobile food cart, and recently won the Broadway Market’s sweet potato cooking contest with a butterscotch sweet potato gelato. She makes 50 kinds of gelato and will sell a half-dozen rotating varieties weekends at the market through Lent. It’s less fattening than ice cream because you use milk instead of cream. The sugar content is a little higher, but on average it has 30 to 40 percent fewer calories per serving than ice cream. What would you consider the healthiest gelato you make? I’d probably have to say the lemon sorbeto; it’s dairy-free, it’s soy based. And we do a raspberry with Splenda instead of sugar. What are some of the other funky recipes you’ve put together? I had a couple for a wedding request an avocado gelato. I did avocado with cilantro in it. That’s probably the funkiest. And for St. Patty’s Day at Larkinville, I made a Murphy’s Irish Stout and a Bailey’s Irish Cream. I like to try anything at least once. I like Chinese, Thai. My favorite is pasta; I make my own homemade sauce. Tacos would be a close second. I like fresh vegetables. I like seafood. I don’t eat a lot of fried food.